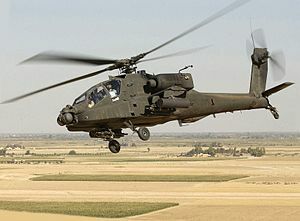 The Boeing AH-64 Apache is a fower-blade, twin-ingine attack helicopter wi a tailwheel-type laundin gear arrangement, an a tandem cockpit for a twa-man crew. ↑ "Boeing Marks 25th Anniversary of Apache First Flight Sept. 30". Boeing. 2 October 2000. ↑ Sterling, Robert. "Apache helicopters roar ahead". Boeing.com. Boeing. Retrieved 16 July 2014. ↑ "Modernizing the Army's Rotary-Wing Aviation Fleet". Congressional Budget Office. November 2007. ↑ "United States Department Of Defense Fiscal Year 2015 Budget Request Program Acquisition Cost By Weapon System" (pdf). Office Of The Under Secretary Of Defense (Comptroller)/ Chief Financial Officer. March 2014. p. 18.